Part of the downtown’s new sports and entertainment district, the neighbourhood is being called False Creek Central. The area includes a new $535-million casino, hotel and entertainment complex being built next to BC Place by Paragon Gaming Corp. Last week, Paragon announced it has revamped its proposal for the project, which included no plans to expand gambling. Paragon proposed to relocate Edgewater Casino at its existing size. The development proposal is significant both in size — as one of the largest in the city’s history — and in meaning, according to architect and planner Michael Geller. “Over 30 years ago (the area) was talked about being landscaped with buildings and now it’s happening,” Geller said, recalling that plans to complement BC Place with living spaces had been floated since the stadium’s unveiling in the early 1980s. He added that the proposal should be viewed as just one part of the broader north shore of False Creek development, a massive project that he said has produced “a very successful community” despite early concerns that the area would be too dense. But, Geller added, the project could compound an already high demand for seats in nearby schools and may inconvenience stadium event goers who park in the area. 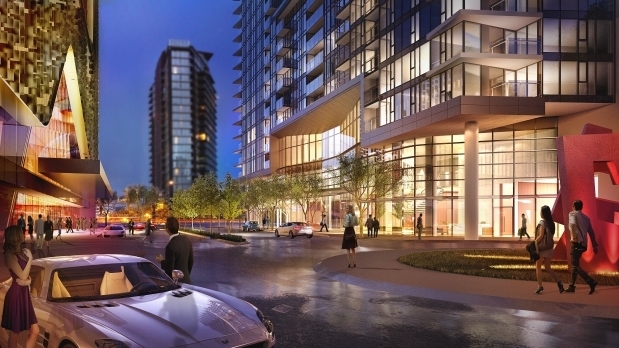 Concord Pacific’s first building at False Creek Central is One Pacific, a condo development with more than 400 units. Marketing for the project is expected to start later this month. The project includes building better cycling and walking connections from downtown to the seawall and the Cambie Bridge. As well, Smithe Street will be lengthened and connected to Pacific Boulevard. Concord announced the new development Wednesday at its renovated presentation centre on the seawall side of Pacific Boulevard. Peter Webb, Concord’s senior vice-president of development, said his company has a 25-year history of building neighbourhoods in the area. In a separate interview, Webb said not all eight buildings in False Creek Central have been fully approved by the city. All the necessary city development steps would take two to five years, he estimated, with final build out occurring by 2023. The city has a policy of setting aside one-fifth of all housing in the area for low-income residents. In 2011, only six of 15 sites in the area had been developed with social housing for a total percentage of 13 per cent, according to a previous story in The Vancouver Sun. Webb said Concord is working with the city on providing social housing. “Right now, there are a couple of sites that have non-market housing, as it’s referred to, designated on them,” he said. One solution, he said, could include giving the city a site for social housing on the Downtown Eastside so Concord wouldn’t have to build its equivalent in False Creek Central. The site under consideration is 58 West Hastings, the vacant lot with an urban garden across from Army & Navy. Fern Jeffries, co-chair of the False Creek Residents Association, said she was “shocked” when she saw Concord Pacific’s plans for False Creek Central in the media. She said despite being part of the Joint Working Group with Concord, the developer never mentioned anything about False Creek Central at any monthly meeting. Jeffries said residents are still waiting for Concord Pacific to deliver on creating a 3.6 hectare (nine acre) park on False Creek from Carrall Street to Science World, where its presentation centre is located. “The local neighbourhood association wasn’t invited to Concord’s media event,” she said. “Even though we’ve been on the same working group for six years, they hadn’t bothered to inform us or seek any advice or feedback. She questioned Concord’s plan to build 1,300 units but said she didn’t have enough details to comment further on the area’s proposed density. Webb said he expected prices to be about $600 to $700 a square foot in False Creek Central. A 1,000-foot condo, he said, would be priced at about $700,000.